Clifton Eugene Hurst was above all, a consummate father, husband, and family man. He was also an entrepreneur; he possessed superior engineering skills and he created and ran a successful business built purely on his determination and the sheer force of his inexhaustible will. The business had a rather simple beginning, with supporting his family being the utmost thought in his mind. Gene and his wife, Edna, started the business with faith, a vision, and limited capital. Opening their first shop behind their home in Thomasville, Georgia in 1967, then founding Hurst Boiler & Welding Company, Inc. in nearby Coolidge, where the Hurst family continues to own and operate it today. They have been at this location since 1970, and manufacture a full line of solid waste, wood, gas, coal and oil fired steam and hot water boilers and related equipment. In 2007, the company celebrated the its 40th Anniversary. Gene always believed a man’s word was his bond, and he steadfastly stood behind whatever he committed to. He was always the first to tell you his success should be attributed to his faith, his family's support, and their many dedicated team members and customers . Hurst Boiler has come a long way since their first shop, and the manufacturing facility and campus now encompasses 17 acres, allowing them to manufacture a large variety of boilers and equipment to meet the diverse conditions and requirements of customers around the world. In 2007 they completed a large expansion doubling their manufacturing space. Continued strong sales have now prompted further construction, bringing the total size of the manufacturing facility to 314,000 square feet. With the current expansion, Hurst now maintains over 350 employees at full production capacity. 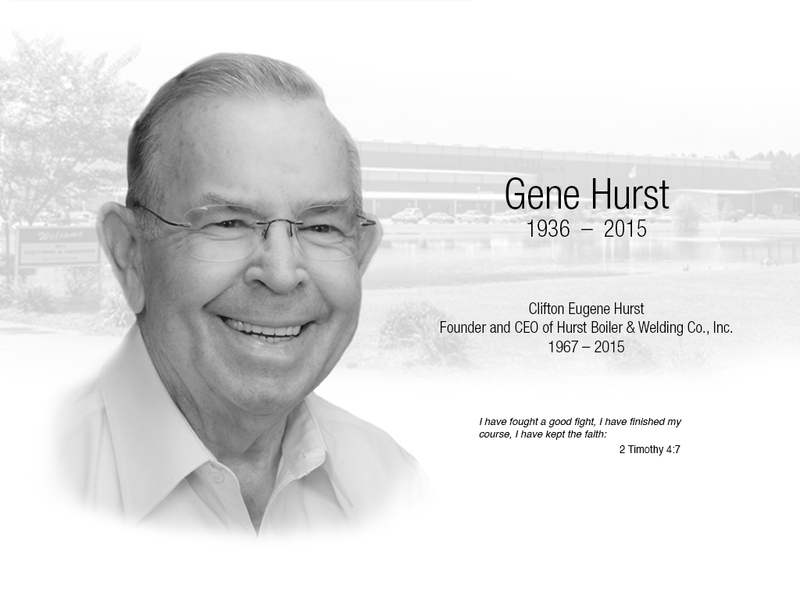 Gene Hurst was surely a visionary of the boiler industry, and one of the finest gentlemen to ever live. Anyone who knew him, in whatever capacity, would certainly agree he was the kindest, most humble, and inspiring individual they had ever had the honor to know. He was a shining example to us all, and today we mourn the loss of that guiding light.